Renovated farmhouse with gites, outbuildings and pool. The lovely mediaeval town of Josselin lies in the Morbihan department of southern Brittany in north-west France. It is overlooked by a magnificent chateau, the Château Josselin, which has perched on a granite rock above the town since the 11th century. 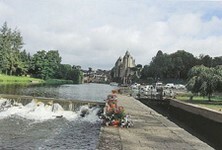 Beside the town runs the wide and tranquil River Oust, and through it runs the picturesque Nantes-Brest Canal. The town has two very distinct styles of architecture within itself. There are the typically mediaeval half-timbered houses, with brightly coloured panels and corbels. Then there are the later, elegant grey granite town houses which somehow manage to sit side by side with the older colombage buildings and look as though it was always meant to be that way. This is the way with much of the town, for the historic buildings manage to encompass a life that is truly modern. The town has plenty of facilities, with shops, supermarkets, restaurants and public services, so there really is a successful blend of ancient and modern! Josselin offers plenty of things to see and do without much travel involved. Within the town there is a beautiful Basilica, with wonderful architecture and amazing views from the top of the tower. Near to the town is an intriguing postcard museum, with a collection of cards dating back many years giving a fascinating insight into life in a bygone age. More up to date pleasures, perhaps, are afforded by the delightful Saturday market, where all the best of fresh local produce and colourful crafts are on sale. How do you like your water… inland or seaside? Due to Josselin's enviable geographical position you can take your choice… pop down to the glorious Atlantic coast, or stay close to home and take a leisurely boat trip on the canal. Walking and fishing are also superb around Josselin. 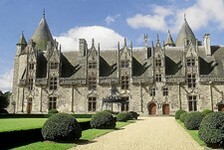 To fly to Josselin you should look at Ryanair, who fly direct to Nantes, as do GB Airways and Aer Arann. It is also possible to fly to Rennes (flybe, Aer Lingus) or Lorient (Aer Arann). The ferry ports of St Malo and Roscoff are within reach, and rail travel is also accessible as you can take a train to Rennes. Brittany has long been a popular place for the English to seek second or permanent homes… there are records of them moving to live in Josselin since the 5th century! In general Brittany is so popular that prices are high, and Josselin, with all its beauty and history, will always be high on the wish list for anyone seeking a dream home in this lovely part of France. The good news, though, is that Josselin is located in the north-east of Morbihan, where prices tend to stay a little lower than on the coast. Do you know Josselin better than we do? Do you have photos of Josselin? Josselin is located in north-western France, in the north-east of the Morbihan department. Access: By air: The nearest airport with direct flights from the UK is Nantes. Other nearby airports are Rennes and Lorient. By ferry: The nearest ferry port is St Malo. By rail: The Eurostar will get you to Paris, where you can catch a train to Rennes. Economy: The economy is based on a mixture of commerce, trade, agriculture and tourism. Interesting fact: Josselin has a long history of British immigration, dating back to the 5th century!